This passage is as subtle as it is splendid (the deft insertion of Toussaint into the peerage of the great white national heroes of his time is accomplished almost by sleight of hand); at the same time, like much of the most inspired political rhetoric, it is no better than half-true. Toussaint left a considerable written record (though Phillips likely knew nothing of it): not only a copious correspondence but also the memoir he drafted in the Fort de Joux... Moreover, he has been described, from his own time into ours, by friends and admirers as often as by foes and detractors. Yet Phillips is right enough to say that practically all first-hand reports on Toussaint come from the white, European milieu; precious few comments from his black and colored contemporaries have survived. It’s also true that very few accounts of Toussaint’s life and work have been nonpartisan. He is almost always depicted—exclusively—as a devil or a saint. Portraits of Toussaint from his own time are reminiscent of drawings of American buffalo by European artists working from descriptions and without ever having seen a buffalo. Many of these images seem to be no more than sketches of generic African features—sometimes exaggerated into grotesque caricature. A study by Haitian scholar Fritz Daguillard suggests that two of the early portraits are at least reasonably faithful to their subject. The first, a full profile view of the black general, was probably done from life as a watercolor by Nicolas Eustache Maurin. Later rendered as an engraving by Delpech, this portrait became a model for many later artists who transported the basic image of Toussaint’s profile into various other contexts. Toussaint liked the original well enough to present it as a gift to the French agent Roume, whose family preserved it for centuries afterward. He wears full dress uniform for the occasion: a general’s bicorne hat, decorated with red and white feathers and the red, white and blue French Revolutionary cockade, a high tight neck-cloth and a high-collared uniform coat, heavy with gold braid. The features in this image agree with eye-witness descriptions of the time: Toussaint is just slightly pop-eyed, his profile marked by a prominent, under-slung lower jaw. The second portrait, a three-quarter view, was singled out by Toussaint’s son Isaac as the only image in which he found his father recognizable. At a glance this second portrait (by M. de Montfayon, who had served under the black general as an engineer) does not look much like the first. Toussaint wears a similar coat as in the Maurin portrait, with gold braid, his general’s epaulettes, his right hand clasping a spyglass against a ceremonial sash. In this image he is bareheaded, his remaining hair gathered in a queue at the back, and we see that his forehead is very high, and his cranium remarkably large. In the Montfayon image, Toussaint’s features look more delicate, less typically African, than in the other; perhaps they were slightly idealized by the artist. If Montfayon makes the jaw less prominent, the difference can be accounted for by the angle of view. The more one looks at the two portraits together, the more reasonable it seems that they represent the same person, though in two different frames of mind. The full profile suggests a head-on belligerence; the three-quarter view presents a wary, intelligent observer. History has shown that Toussaint Louverture possessed both of these qualities, in abundance. The Haitan people, as they named themselves, were the first to put an end to slavery in the New World, with their definitive defeat of the French in 1803 and their declaration of independence in 1804. In the course of the next half-century, the “peculiar institution” died, by slow and miserable degrees or in great spasms of violence, the last of which was the American Civil War. 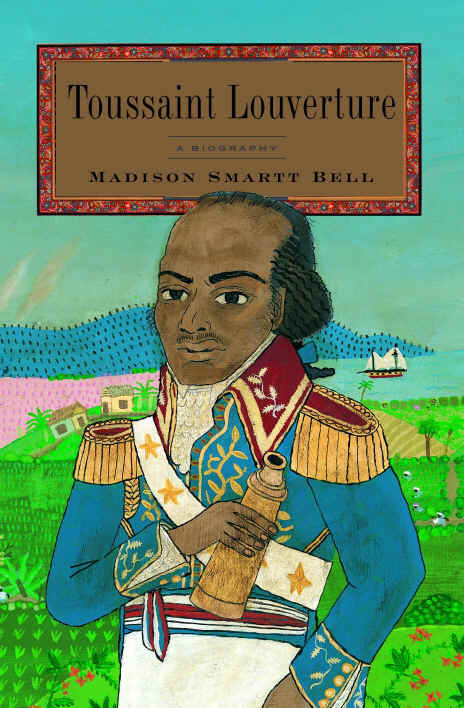 The story of Toussaint Louverture was adopted by the eighteenth-century abolitionists, not only Wendell Phillips but also Englishmen like M.D. Stephens and James Beard, and Frenchmen including Lamartine, Victor Schoelcher and Gragnon Lacoste, who burnished and enshrined it into legend. Emerging from the success of the Haitian Revolution, the gens de couleur, few in number as they were, enjoyed significant advantages of wealth and education over the vast black majority. The first Haitian historians—Beaubrun Ardouin, Céligny Ardouin, Saint Rémy, Thomas Madiou—came from this class, as did Toussaint’s first Haitian biographer, Pauléus Sannon, who served as Haiti’s Foreign Minister during the World War I era. The colored historians who wrote in the early nineteenth century had a rather ambivalent attitude toward Toussaint, whose army had won a fairly well-deserved reputation for brutality during a vicious civil war which pitted the newly freed blacks against the gens de couleur and which ended in 1800 with the colored party being crushed. Though Toussaint’s importance to the overthrow of slavery and the independence of Haiti was incontestable, Madiou and the other mulâtre historians could hardly help seeing him, and portraying him, as an oppressor of their tribe; Sannon, with a century’s distance on the events, described the black general with a greater objectivity and with less strangled rancor. In the twentieth century, the story of Toussaint was taken up by the writers of négritude: a pan-Caribbean movement of black cultural pride. 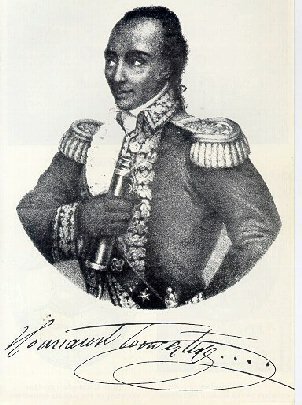 The Martiniquais writer, Edouard Glissant, who hails from another former French sugar colony, wrote a play called Monsieur Toussaint, which situates the black general in a newly evolving Caribbean literary tradition rather more securely than Lamartine had managed to locate him in the French. Aimé Césaire, best known for his poetry, wrote a book which is part biography, part political analysis, mythologizing Toussaint in a somewhat different way—as the first person to embody a solution to the problem of colonialism. The Black Jacobins, by a historian from Trinidad, C.L.R James, was until recently the standard work on the Haitian Revolution; James, writing in the late nineteen-thirties, has the attitudes of a fairly dogmatic Marxist, yet the avowed Marxist disbelief in the power of “extraordinary men” to influence history simply evaporates in James’s portrait of Toussaint Louverture. The Duvalier dynasty in Haiti, which lasted from 1957 to 1986 as the most stable and also the most thoroughly repressive government Haiti has known since independence, associated itself with another Revolutionary hero, General Jean-Jacques Dessalines, fully as important an historical figure as Toussaint, but generally seen as much more violently authoritarian. When Jean Bertrand Aristide came to Haiti’s Presidency in 1990, on the crest of a wave of democratizing populism that many Haitians called the “Second Revolution,” he seemed to want to identify himself with the more conciliatory figure of Toussaint Louverture. In the beginning, the implied Aristide-Louverture comparison was subliminally subtle, but during the Haitian Revolution’s Bicentennial year of 2004, when Aristide was forced from office and the country by a United States-assisted coup d’état, he quoted—verbatim—the words Toussaint had famously spoken when was arrested and deported by the French in 1802. 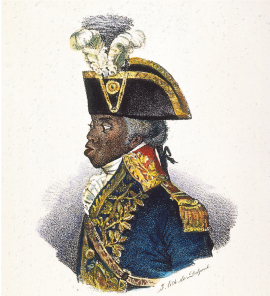 For two centuries, historians, biographers, playwrights, novelists and even politicians have constructed whatever Toussaint Louverture they require—and almost always it is an extreme Toussaint: either a vicious, duplicitous, Machiavellian figure who not only destroyed France’s richest colony in an (inevitable) regression to African savagery but also laid the foundation of the most authoritarian and repressive elements in the Haitian state which came after him, or a military and political genius, autodidact and self-made man, a wise and good humanitarian who not only led his people to freedom but also envisioned and briefly created a society based on racial harmony, at least two hundred years ahead of its time. The latter figure is found in twentieth-century English biographies by Ralph Korngold and Wenda Parkinson, who, like Colonel Vincent two centuries previously, admire, defend and advocate Toussaint. By the usual extreme contrast, the oft-revised and updated biography by the French scholar Pierre Pluchon, while almost certainly the best-documented work of its kind, seems to take its attitude toward Toussaint unadulterated from the hostile, cynical report of General Kerverseau. To pierce this cloud of contradictions one would like to return to the man himself, but it is difficult to do. Famously elusive in real life, Toussaint Louverture is no less elusive to the historian and biographer. The fictionalizing of his character is aided by the fact that during the first fifty years of his life, Toussaint walked so very softly that he left next to no visible tracks at all. Furrows, while waiting, its immortal roots.